Just got back from vacation in Ohio in time to post this DNs. What's in Ohio, you ask? Seasons. Hey there EpicDuelists! I hope you’ve been enjoying your week so far. This week is going to be more focused on code than content, so it might be a “boring” update for some of our players, but definitely not a boring week for Titan and Hudelf! Players will be able to level up with one click, and apply all points to the character. So, you could just open your stats page, click around a bit, and be able to save your configuration. Later on (as in “after we’ve implemented the first revamp), we’ll be adding further training revamps, including the ability to go down one level for small adjustments to one’s build. No longer will you have to completely retrain because of one stat point! Also, this should make the retrain/level up process about 5-6 times faster. We’ve begun to regionalize EpicDuel, and the first step is to translate the entire game into Portuguese! Charfade is hard at work exporting all of the game text. This is only one step, but I think we’re going in the right direction in making ArtixEntertainment more accessible to our international player community! Titan’s working on further securing some recent exploits, preparing the new EpicDuel website, and going through the code to further reduce lag. I don’t want to get into TOO many specifics, since we already know that the next balance updates won’t be ready for Friday. But, we’ve confirmed adjustments to how Field Medic and other skills will work, and how some skills will synergize with one another. Balance updates require extensive testing, so please be patient as we continue to build. This is a reminder that if your account has been compromised or "hacked", please visit THIS SITE for more information. Like Artix said, 95% (actually closer to 99%) of all "hackings" are the result of account sharing either to let a friend play on an account or on the promise of free Varium or ACs. I feel I should reiterate that contacting Developers or Mods directly will not resolve your issues any faster. Titan and Nightwraith are busy enough building EpicDuel, and unfortunately cannot spend time resolving issues for individual players. Following my Silverfish design notes Insect Fact, one of my players showed me a photo of a centipede, claiming it was a silverfish, so this week’s Insect Facts is dedicated to a group of animals commonly thought to be insects but in fact are not. The centipede is one of these animals. With a name that means “one hundred feet”, centipedes are known for having many legs, with numbers from 10 to over 300! They are related to insects in the sense that they are terrestrial arthropods, but they can be distinguished from insects by the large number of legs and body segments. According to the National Wildlife Foundation’s Field Guide to Insects and Spiders of North America, there are no centipedes in North America that are deadly to humans, although their venom can be quite painful, their appearance quite frightening, and they do present a danger to people who are allergic to insect venom. They can be beneficial, however, as some species of centipede (eg. the house centipede) eat cockroaches. Most citizens of Fortune City have come across this jolly fellow. Long before the War, a young Hank Acker had a dream, to become the greatest culinary artist the galaxy had ever known. He attended the most elite culinary schools, became a master patissier, and eventually traveled to Delta V. Never one to back away from a challenge, he designed and built his own kitchen- a custom oven built from an old drill engine, a rotary saw bread slicer, a liquid nitrogen deep freeze for ice cream. He set up the front of a building as a shop, where he could sell freshly-baked bread, ice cream and candies, hot coffee or tea, and of course the most wonderful selection of expertly-crafted pastries... all at a reasonable price! Baking is, of course, not without his dangers. Hank lost his eye when a subterranean mining vehicle caused an earthquake near the shop, causing the melted sugar threads Hank was spinning to decorate a croquembouche to fly into his face. After losing his leg in a horrible baking accident involving a pain au chocolat, Bienenstitch, and a whole lot of marzipan, he hired a local girl- Anya- to take over the front of the house, and occasionally summon medical care. After the Exile, at Anya’s insistence, Hank found himself trading in his porkpies, fairy cakes, and chocolate babkas for swords, clubs, and guns. But still, he is able to sell cakes to Exiles- which has allowed him to make some renovations to the storefront, and dreams of a day when he can brush the dust off of his whisk and choux bag. It seems like only yesterday we were amazed that one of our players had accumulated 5,000 wins. Now we’ve had to add new ranks to recognize the sheer amount of wins some of you guys have! What are they? Well, until you reach it, it’s a mystery! We’re rolling out with a few bug fixes. For example- as awesome as it was, supercharge will no longer do the Haduoken gesture, but the fireball will come out of the weapon as intended. We've also fixed many leaderboard related bugs that were introduced in the last update. To clear up some confusion from the last update. The All-Time leaderboards are now only update once per day. This was not done to make you mad, but because the database queries to update the leaderboards were extremely intense and alone responsible for most of the lag. The Daily Leaderboards update every 3 minutes as per usual. We’re restocking Charfade’s Inventory! Visit Charfade in Fortune City to grab them while you can. Have you ever seen the small silvery creatures that sometimes live in your carpet? You probably know them as “Silverfish”- but an entomologist would call them members of the order Thysanura. Silverfish are elongated, flattened insects less than an inch (25 mm) long, with a tapered abdomen that gives them a fish-like appearance. They have three long tails, small compound eyes, and no wings. They typically live for two to eight years, and may go through 17-66 molts in their lifetime. They are very rare in the fact that they continue to molt after mating. Silverfish live on polysaccharides, which include carpet, clothing, cotton, linen, silk, sugar, paper, books, plaster, photos, rayon fiber, and even leather or synthetic fibers. Because of their appetites, silverfish are considered a household pest. But, they do not spread disease. Common predators are earwigs, house centipedes, and spiders. Ahoy there, you Bilge rats, man Jacks and Stowaways! It be your Master-at-arms, Cinderella. Hold fast and read well this here flag hoist, to avoid bein’ sent to Davy Jones’ Locker. Yarr, it be Talk Like a Pirate Day, and for the first time, we’re celebrating here on Delta V. Let your colors fly with the Talk Like a Pirate Day achievement, send your enemies across the bar with new Pirate-themed weapons, and look the part with new nautical styles! If you're really feeling saucy, you'll also notice the new pirate-themed Faction flags to create a Jolly Roger of your choosing! And of course, you’ll need to talk like a pirate on September 19th, or you might have to meet with the Captain’s Daughter! In order to make enough epic weapons for everyone, Varium and non-Varium alike, we're taking a bit more time to finalize and test the TLaPD weapons. Look for them to drop at BigTuna's shop in the West Naval Yard around the actual Talk Like a Pirate Day (September 19). It's been a shark kinda week. 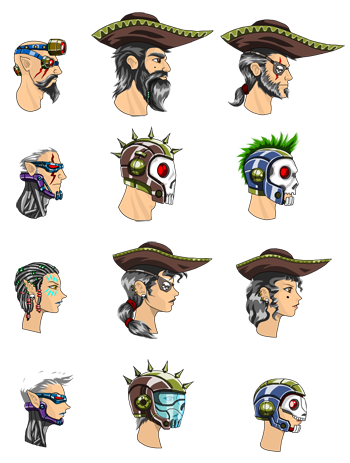 Be stylin' with classic and futuristic pirate styles! Stop by a VendBot anywhere on Delta V to pick up the TLaPD achievement for 1500 Battle Tokens! Nightwraith was nice enough to extend the length of time the Dragon weapons were in the shop. However, it’s time to send them down to Davy Jones’ Locker until next year! Everyone who should have received the Dragon Master achievement but was not awarded it should have already received it by now. Email Nightwraith@Battleon.com if you're still having an issue! Making the Lag Beast Walk the Plank! Titan and his new assistant have been working feverishly all week to determine the source of the recent lag woes in EpicDuel, which have caused skipped turns and other bizarre and annoying bugs. Are two heads really better than one? We'll find out soon enough! Literally ever action in the game have been examined to address the problem, which means drastic changes abound through the engine. If you notice any new bugs crop up, please report them in the forums! ...Water bugs! Known among scientists as Belostomatidae, Giant Water Bugs are the largest insects in the order Hemiptera (also known as True Bugs), between 2cm and 12cm or more in length. These giant predators prey upon crustaceans, fish, and amphibians, and have been known to feed on baby turtles and water snakes. They pierce their prey and inject the victim with digestive fluids. They have been known to bite humans, and their bite is considered the most painful. One interesting aspect of Belostomatidae is that they are one of the few insects to demonstrate parental care. After mating, the female lays her eggs on the male’s back, and it is he who cares for the eggs until they hatch. Ahoy there, EpicDuelists! By now I’m sure you’ve all read Nightwraith’s and Artix’s recaps of Dragon*Con (if not, go read them now!) If you’re a loser like me and didn’t get to go, there’s always next year! But now here’s a bit about the ninja update that just happened! You may have noticed that some things look different in game- for example the home editor buttons got a lot more shiny (oooh... shiny!). This is reflective of general changes to the interface system. 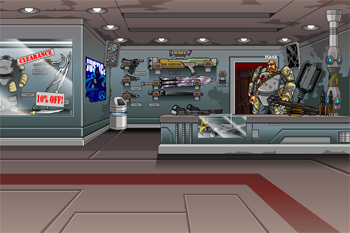 We’ve been improving the way that the buttons and interfaces in EpicDuel work in order to make them more streamlined. Another example is the Inventory screens, which were improved over the weekend. Mages should find that their builds are more versatile now, and sword-wielding mages no longer have such a big percentage of their skill trees blocked off. Plasma Rain and Bludgeon no longer require staffs. This should prove to be a significant buff to the mage classes. Since DragonCon is over, the Draconic weapons will be leaving the game! We left them in a little while longer, since there was a delay in the last update (we got delayed last time, but we’re early this week? MADNESS!). The Dragon and Back to School weapons will remain. Everyone who purchased a weapon qualifying them for a Dragon Master achievement will also receive this valuable achievement! I’d like to take this opportunity to formally welcome Hudelf to the EpicDuel staff! Hudelf is joining our little team as a programmer. Let’s all wish him a warm welcome and a smooth transition! Remember, he's still an apprentice, but he's learning quickly the arts of code sorcery from Titan! Insect Fact of the Week: Butts! This week, we’re going to learn about some of the most interesting butts in the Class Insecta: Fireflies! Fireflies (or Lightning Bugs) are members of the family Lamprydiae in the order Coleoptera. This means that they are neither bugs nor flies, but beetles! They’re called Lightning bugs or fireflies due to the fact that their butts glow. Fireflies have a set of light-emitting organs on the lower abdomen, in which a bioluminescent chemical process takes place. The light produced is a cold light- it contains no heat/infrared frequencies. The glow serves as a defensive mechanism for larvae and as a means of communication for adults. This is pretty unique among insect species- most mating signals are mediated by scent, but fireflies use visual communication. Some species have very distinctive courtship signals, where the male signals to a female, and she will glow in response to him. However, females of some fireflies will mimic the response of females of other species to lure males, who they will then eat. Nom. There's nothing quite like it. At least, not in my limited experience. A mini-Universe of condensed nerd culture that forms and dissipates every Labor Day weekend is truly remarkable, and I'm happy to have participated in it for the second time this year. Just after the crack of dawn, we loaded the Awesome Party Bus of Doom with costumes, luggage, and laptops, snacked on coffee and muffins, and began the long trek to Atlanta, GA for Dragon*Con (after waiting for Stratos, of course). The journey was long and fraught will peril...in the form of ZOMBIES! Well, not real zombies, but zombies on a popular TV series Korin brought for us to watch that happens to actually take place in Atlanta! After we arrived safe and sound at the hotel (no zombies other than cosplayers! ), we promptly received our badges and checked into our rooms to decompress and gear up for the fan meet-n-greet pizza party in Artix's suite. It was great fun to see you guys in real life, even if you didn't look anything like your in-game counterparts. I guess hotel security confiscated your armor and weapons! Voltaire even stopped by for a special guest appearance! It was extremely amusing to see AE staff dressed as their in-game counterparts. We had more cosplaying staff than ever before, and Artix's paladin armor received a major, full-metal upgrade! I can't even imagine what the players and hotel staff were thinking as we filed into that room on Friday. This panel was even longer than last year's, but it didn't feel like it. If anything, we could have gone for another hour or two! There's always so much to do and show and tell and so many questions to answer. We hope to post some clips on our DNs once they're edited, but if your Youtube-Fu is strong, you may be able to find a camera phone clip or of the panel's highlights. Thanks again to everyone who was able to make the journey out and see us in person! Dragon*Con is a time for work and play. A time for AE staff to recharge their batteries, make connections, and converse with fans. This convention, a much higher percentage of time was devoted to work than previously. Most of our games were releasing major updates and some staff even stayed behind to put in insane hours over the weekend to make sure the releases were as polished as possible. Titan himself rolled THREE DIFFERENT RELEASES for EpicDuel to install interface fixes, improve stability, and, of course, release the Draconic Multi-class Weapons! Did you pick them up? If not, you're in luck, because we decided to keep them in game until we roll our next release (possibly Wednesday) to ensure everyone has a chance to get them since we released so late on Friday. As if the stresses of preparing for Dragon*Con and our panel weren't enough, we decided to launch a new game (a several major game releasing) during the convention: Ponies Vs Ponies. There were some technical problems with the launch, made even worse by the fact that it was impossible to communicate with the outside world during the panel in the Sheraton, which had apparently just installed their dwarf star alloy walls. Why do we do this to ourselves? Because we love you, that's why! Card games are games for which I have zero skill. The gaming public learned this fact when Practel challenged me to a vicious game of BattleOn Battle Cards. I was utterly devastated by his relentless onslaught. He used every opportunity to counter my attacks, negate my blocks, and steal my paltry defenses. Such spectacular failures are often the stuff of myth and lore, the details too fantastical to be accurately recounted. This monumental defeat will haunt me until next Dragon*Con, when I have a stack of "custom" cards (maybe?). Though I wasn't able to capture any cards, we DID manage to give away ALL of Charfade's signed EpicDuel postcards at the fan table! If you have one, congratulations! You're one of 100 people with a card! It seems to be tradition that the weather for the last day of the con reflect our emotional state upon leaving -- sad and gray. Once again, we trudged to the bus and loaded our collective experiences in the overhead bins on the bus and began our trek back to Florida. For those of you who have never been to Florida, we have some fascinating weather patterns here. Within the span of a minute, the weather can go from sunny and dry, to a torrential downpour, and back again. This happened the entire ride back on the bus as we watched awful cartoons from the early 90s (THEY WERE COOL AT THE TIME), recalled the best con stories, and tried our best to sleep. When we finally arrived at the lab, the sky was angry yet again, but there was no rain in sight. We had finally unloaded our costumes and luggage from the bus and were about say our goodbyes (until the next day) when suddenly: Drip, drip, drop, ASLPPPPPOOOOOOOOSSSSSSHHHHHHHHHH!!!!!!!! The entire sky opened its fearsome maw and instantly soaked everything and everyone not loaded in a vehicle. Now, it's back to business as we work on another release for Wednesday! Bye Dragon*Con! Dragon*Con 2012 can't come soon enough!